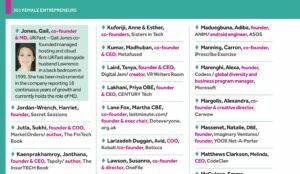 MarketOrders is proud to announce their co-founder and COO, Sukhi Jutla is named as a Top 100 Woman in Tech by WeAreTechWomen. The winners of these awards showcase remarkable women within the technology sector covering a wide range of roles such as Applied Machine Learning Scientist; Cyber Security Consultant; Radio Modelling Engineer; Futurist; a Research Associate in Turbomachinery; and Rapid Prototyper. female tech talent in the country. The TechWomen100 awards are the first of their kind to focus solely on the female tech talent pipeline and to also recognise the impact of champions, companies and networks that are leading the way for the future generations of tech talent. Ireland and 28,000 votes of support from across the globe. Today, retail shopping involves one of two options; you either buy products online or walk into brick and mortar stores. These days however more and more people want their goods to be delivered faster and cheaper to their doorsteps which continue to put pressure on traditional retailers or brick and mortar outlets. But when online shops can’t quite deliver, the customer needs to go to the store themselves and this experience can be very frustrating. Therefore this cannot be the only option. So let us introduce a new form of retailing called ‘Smart Retailing’ being pioneered by my company, MarketOrders. We are shaping up a new type of retail experience by combining the best of both online and offline retailing for the gold jewellery industry. At MarketOrders, we call this a converging platform. Our platform is helping to redesign traditional stores into smart retail stores. We help retail jewellers to embrace new technology to enhance their traditional retail stores. eCommerce and the high street don’t have to fight for sales. Instead, we help our retail jewellers discover how they can use digital tools like MarketOrders to help reach more customers by ordering smarter and cheaper. Even though the world is becoming more digitised, there is still demand for in-person purchases. People don’t just want to buy a product. They want to buy an experience, especially when it comes to high-value items like gold and diamond jewellery. Retail stores can embrace this growing trend through what we call ‘Smart Retailing’ and we are already helping traditional gold jewellery retailers to adapt to the new digital world in new and creative ways. So let’s start with your experience when you visit any gold jewellery shop if you have been to one. It takes hours for you to choose and pick that perfect item for your loved ones. You might not like the design or style or maybe it’s too expensive. It could also be a dull experience if you are having to get the attention of store staff and they are not being particularly helpful! You could purchase the item online however that is also not a perfect experience. You may want to touch the item, feel it and try it on. The item may also need to be made to order and can’t accommodate a suitable delivery window in time. From our experience, we have seen that most customers prefer to buy local especially when it comes to jewellery. Now through the MarketOrders platform and its hyperlocal mobile commerce, everything will be customised the way you want (business owner and end consumers) and the experiences will be powered with technology. This will help the customers to make more informed choices and improve efficiency. The MarketOrders platform allows the retailer or their customers to pick and choose what they want, when they want and at what price they want. Purchasing gold jewellery is still operating in a very traditional way. The process was designed decades ago. The retailer has to visit the suppliers to find designs that suit his customers needs based on gut feelings as nothing is digitised or data-driven. This costs time and money and is an inefficient process. MarketOrders redesigns this experience by bringing universal designs onto our platform. Retailers can view the products they want with no sales pressure to buy, no need to travel to the suppliers on the other side of the world and no longer having to leave the business unattended. Retailers can also purchase from one source instead of multiple distributors which is also time-consuming. MarketOrders allows retailers to browse what they want and check the price suitability before placing the order and make a request to deliver or pick up at a particular time. All the small traditional retailers can get a unique makeover by using the MarketOrders platform. Most brick and mortar jewellery retailers have not changed the way they operate since the mid-eighties and these stores are the lifeblood of many localities and communities. Today they need to be more convenient to cater to today’s shoppers and satisfy their experiential desires. The real transformation that MarketOrders will bring is digitising the traditional store. The technology that MarketOrders is building will help traditional retailers with the analytics of their store. This will help decide what products they need, how much they need, who is their customers and etc. This means the local stores will be better enabled to serve the needs of the local customers. The possibility for small brick and mortar shops are endless with MarketOrders where we are helping to reimagine the stores the way their customers want to shop. Smart Retailing is the future for the gold jewellery industry. MarketOrders is thrilled to announce they have been announced as Finalists in the West London Business Awards in the Start Up of the Year category. The judging panel of the West London Business Awards 2019 met on Wednesday 21 November and today announces its shortlist. The Awards recognise the outstanding achievements of organisations and individuals across five themes: sector leadership, sustainable & responsible business, economic growth, corporate leadership, and individual leadership. The winners in each category, as well as the overall West London Company of the Year 2019, will be announced at a glittering awards ceremony and dinner on Friday 8 February at Twickenham Stadium. Now in their sixth year these are the only business awards for the West London sub-region. They celebrate business excellence, and showcase the innovation and entrepreneurial vibrancy of West London’s remarkable business community.